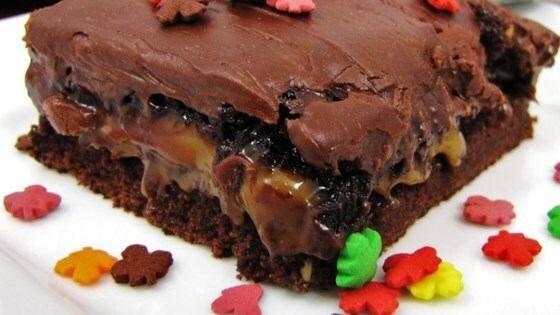 "Chocolate cake with melted caramels, nuts, and chocolate chips in the middle." Mix cake mix according to package directions. Pour a little less than half of the batter into prepared pan and bake for 15 minutes at 350 degrees F (175 degrees C) remove from oven. Melt caramels, margarine, and milk in the microwave on high (takes about 10 minutes), stirring a couple times. Or alternately melt in a sauce pan over medium low heat. Pour melted caramel mixture over cake, sprinkle with pecans, and chocolate chips, and pour remaining cake batter over the top. Bake at 350 degrees F (175 degrees C) for 20 to 35 minutes. Wonderful cake! It was a bit hard to tell when it was done because the toothpick test doesn't work well with caramel. Thanks for the recipe!